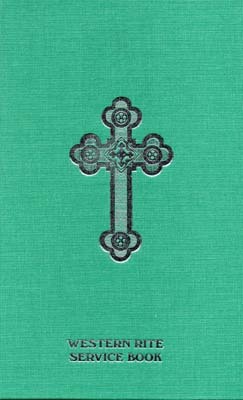 The official service book of the congregations of the Western Rite Vicariate of the Antiochian Orthodox Christian Archdiocese of North America. These congregations hold the same faith as all Orthodox Christians, but worship using liturgical forms deriving from Western Europe in the first millenium, when most Western Christians were still in the Orthodox Church. The Western Rite began to be restored in the Orthodox Church in Europe in the 19th century, and in North America at the turn of the 20th Century, when it was approved for use in the United States by the Holy Synod of the Russian Orthodox Church. In 1961, the Patriarch of Antioch, ALEXANDER III, authorized use of the Western Rite within the Antiochian Archidiocese of North America. This Service Book includes the daily offices of Matins and Vespers, the Eucharistic Liturgies, and the sacramental rites, the Psalter, and devotional materials. There are two forms of the Divine Liturgy. The Liturgy of St. Gregory is an English translation of an ancient Roman Latin rite, commonly call the Mass, as corrected and approved in 1870 by the Russian Holy Synod and subsequent Orthodox Patriarchs. 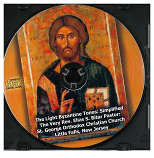 The Liturgy of St. Tikhon is based on the Holy Communion service of the (Anglican) Book of Common Prayer, and was corrected and approved by the Russian Holy Synod in 1904. It is named after St. Tikhon because it was he who, when serving as missionary bishop in America, was instrumental in securing its original approval. The English style throughout is traditional, based on Elizabethan usage. This is a handsome and sturdy volume, bound in light blue cloth with silver stamping (no dust jacket). The print is large and clear, and the page layouts are tasteful and readable. It is designed for use by both clergy and laity, in the church and in the home. The first edition was published in 1989. This is the third revised and expanded edition of 2005.
size: 8.75 x 5.65 x 1.2"
As a life-long Anglican, I thought about looking seriously into the Western Rite Orthodox Church, so I bought this "Service Book." It is just a "bastardization" of the 1928 Book of Common Prayer with none of it's usefulness, like, the Daily Office Lectionary, Weekly Mass Lectionary, no Sunday Collects, no upgrades to the Daily Offices. I grew up on the 1928 BCP and have prayed the 1979 BCP for 40 years. This book could have been so much more useful and brought up-to-date and, frankly, much more Western Catholic. Disappointing.